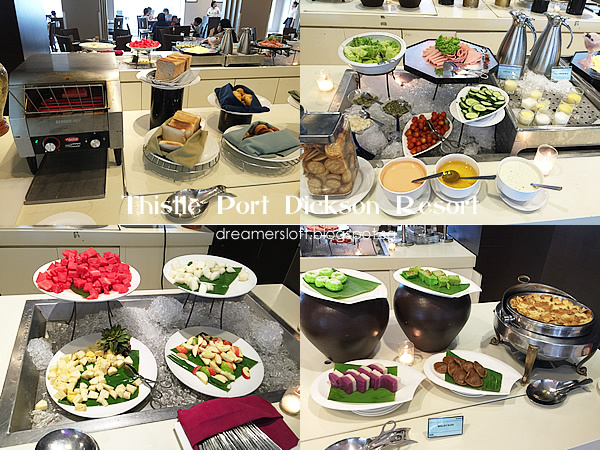 When it comes to food/dining during vacation with the little rascal, there are many more factors to consider, like whether the food is suitable, whether he likes the food, whether the place is crowded (incessant nagging from hungry kid can spoil the entire meal!). If it was just the two of us, we could go places and eat ANYTHING we like. 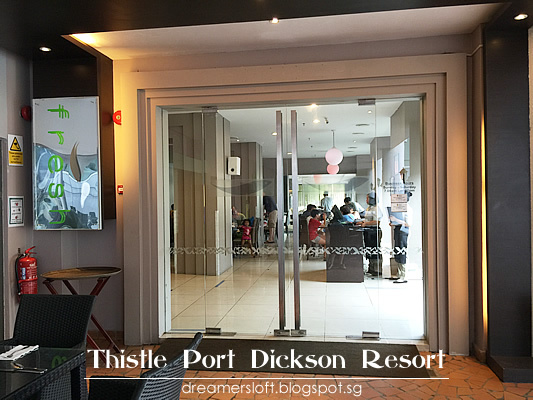 For our first night at Port Dickson, we decided to stay in and dine at one of the restaurants because all of us were tired from the swimming, and the little rascal was hungry as well. 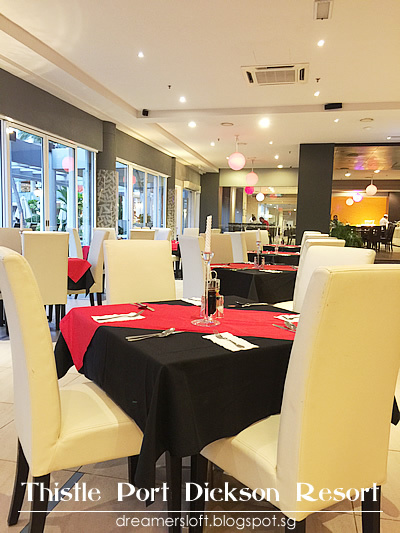 There's a Chinese restaurant, Italian restaurant and an all-day dining restaurant that serves ala-carte and buffet. We opted for the Italian. The restaurant was rather quiet so we were served promptly. 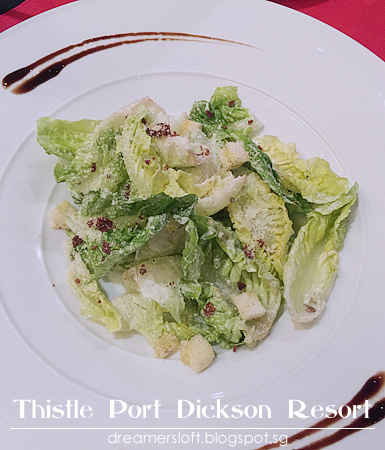 Caesar salad to share. The little rascal only had interest in the croutons. Nothing to rave about since this is a very common and easy to make salad. 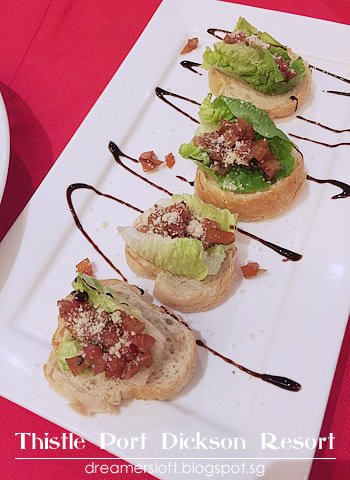 Bruschetta which was quite nice. Bread was crispy and tomato salsa juicy and tangy. 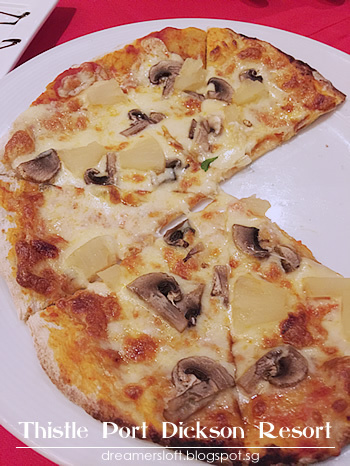 The little rascal ordered his very own "choose your own toppings" pizza with mushroom, pineapple and cheese. Pizza dough was handmade and baked in a brick oven, very crispy and yummy! 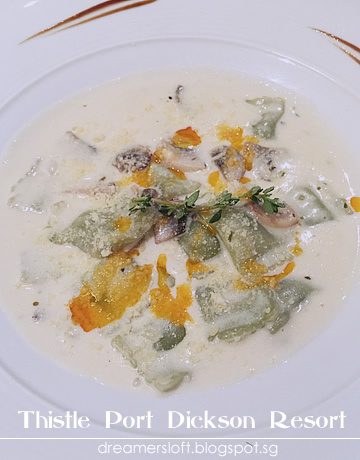 Hubby ordered a ravioli, the creamy sauce with truffle oil was not bad. What blew us away was the Pan-fried salmon that I ordered. The salmon was pan-fried to perfection and the meat was so tender and juicy. It was so delicious that the little rascal ate a third of it! The creamy potato, sauce and side vegetables were also very nicely done. 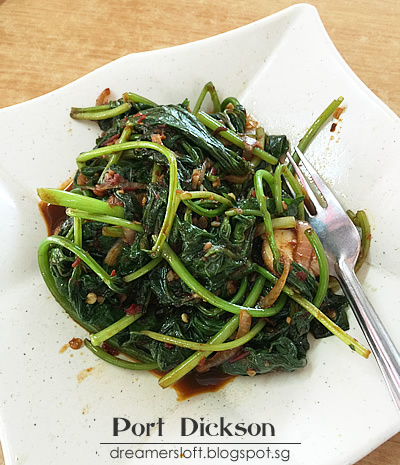 We were quite surprised that we were able to enjoy such a well-made dish here. 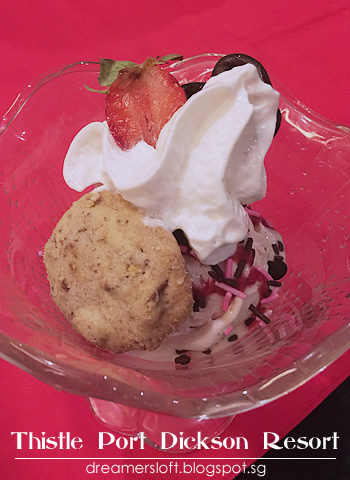 The little rascal insisted on ordering a homemade strawberry ice-cream which was not bad. All in all, a very worthy dinner! 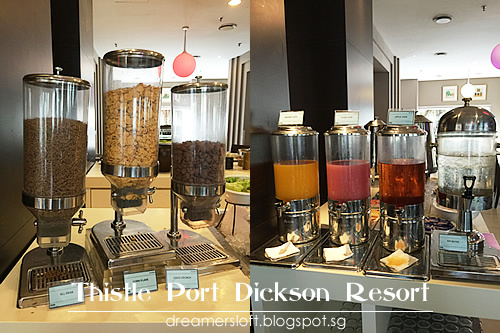 Breakfast was included in the room rate and served buffet-style at Fresh restaurant. Luckily it was a weekday and restaurant wasn't crowded. During vacations, I prefer peaceful, relaxing and quiet atmosphere, that's the whole idea. But then again, with the little rascal it's a different story. Quite a reasonable spread. The usual suspects, bakery section, salad station, fruits, local cakes/pastries. 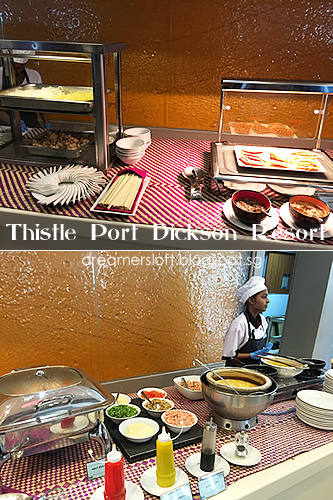 Local fare - roti canai with curries, nasi lemak, porridge and the usual breakfast items like baked beans, grilled tomato, sausages etc. "Live" stations serving cooked-to-order noodles, waffles, eggs. On the second night, we decided to dine in again and this time, we ordered from the room service menu. The little rascal loves room service, I guess to him there's something fancy about having food delivered directly to the door-step and enjoying it in the comfort of the room? 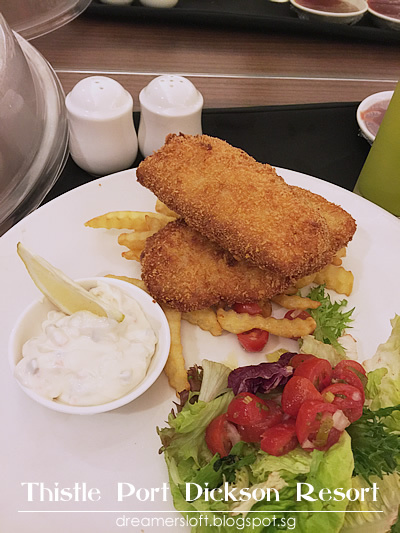 The little rascal's fish and chips. On hindsight, I should have ordered something light and share this with him as the portion was big and he could only finish one piece of the fish. 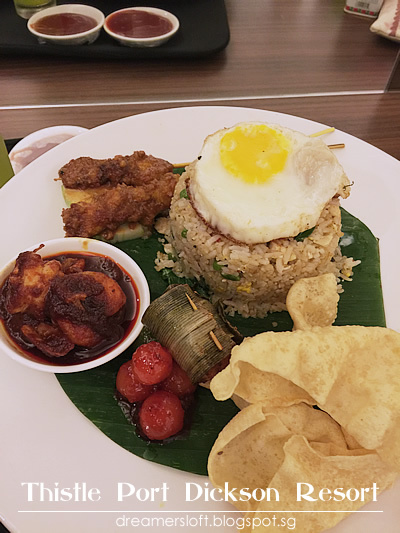 I was craving for nasi goreng kampung which like I said a mistake as the portion was too big too and I couldn't finish it at all! 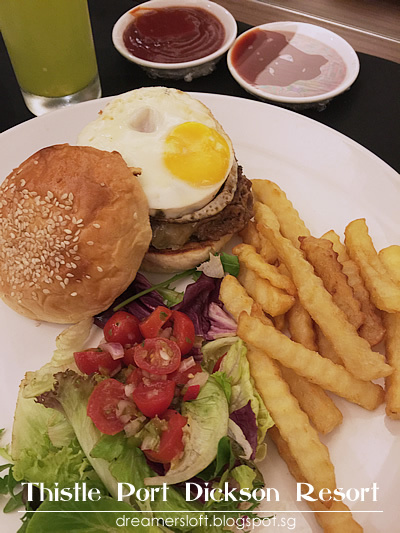 Hubby's beef burger looked yums! Would say that the room service was quite efficient, food quality quite good and portion certainly generous. 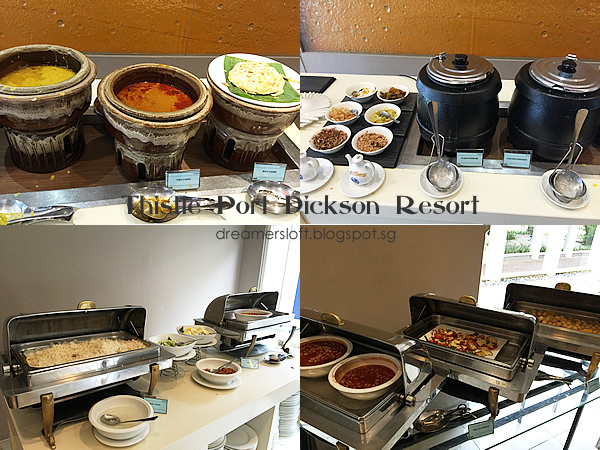 During our second day at Port Dickson, we ventured out for lunch. 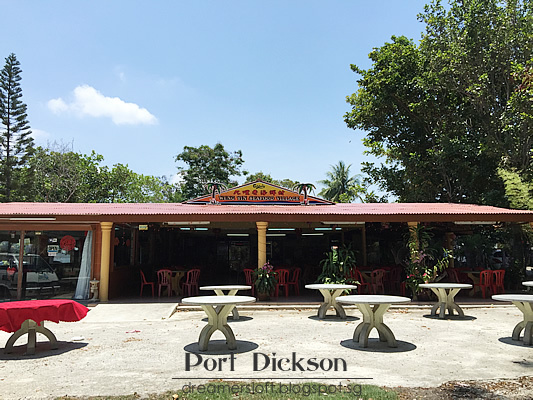 Before the trip, I searched the internet for recommended places for seafood and decided on Weng Yin Seafood which was very near to the resort. 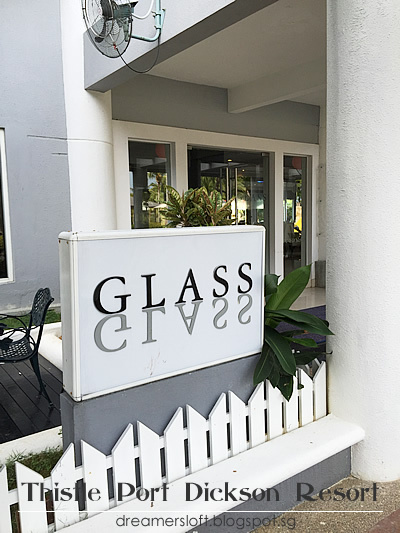 As it was a weekday afternoon, the restaurant was empty. 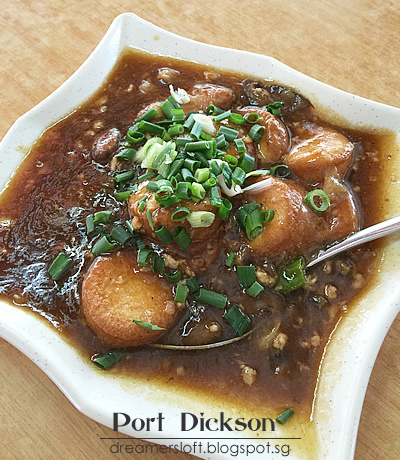 This three-flavour deep fried fish is supposedly the signature dish of the restaurant. 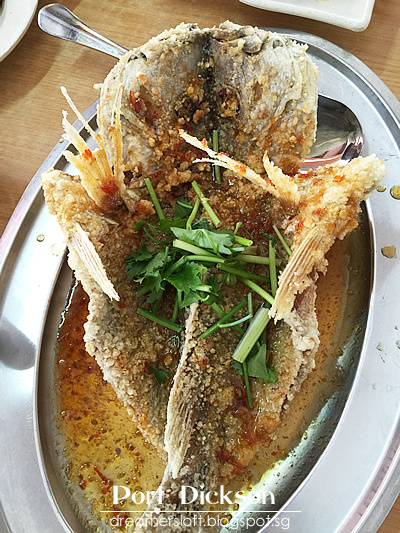 Fish was fried perfectly to a crispy with tender meat. Sauce was spicy, tangy and sweet but I found it a tad too heavy and sweet. Tofu dish for the little rascal who couldn't eat the rest of the dishes. (that's the problem when dining with young kids). Sambal kang kong. Not bad. 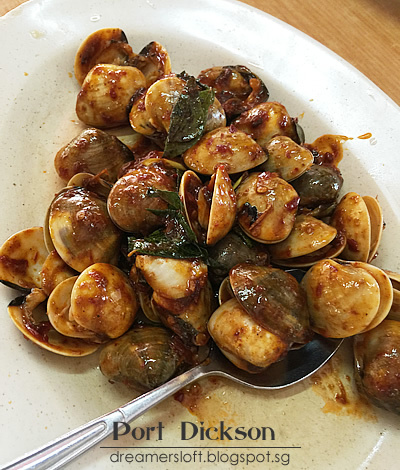 Sambal clams with basil. It was so-so, I found the clams not very fresh. Creamy butter prawns. 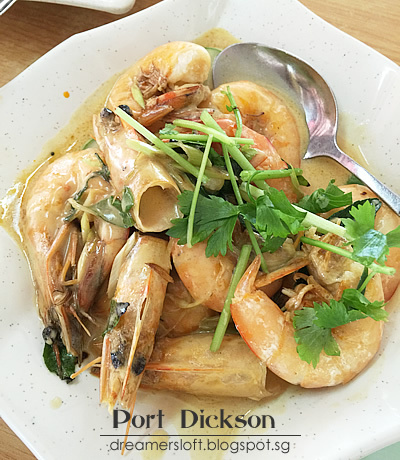 The prawns weren't fresh so this dish was out. Overall, I thought the food standard was so-so only. 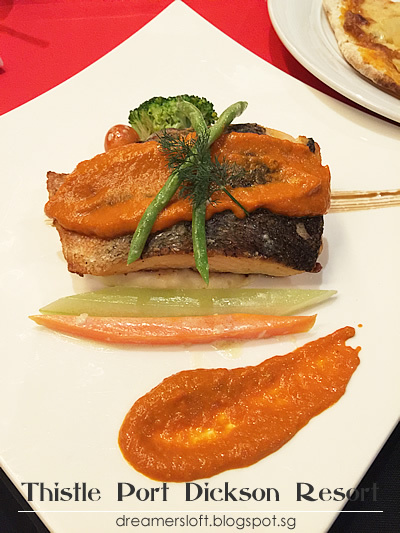 The only saving dish was the three-flavour fish, but it wasn't the best we've eaten. 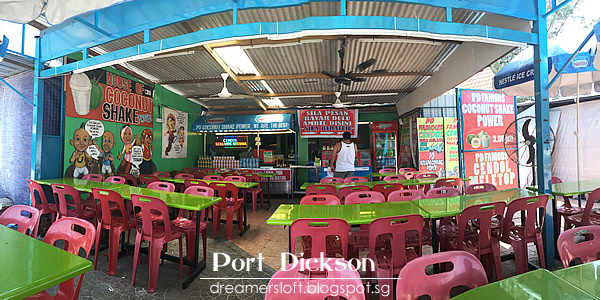 If we were to return to Port Dickson again, we would probably try other restaurants. After our lunch, we drove to a nearby beach area where kayaks, canoes, jet skis are available for rental. The whole place was quiet since it was a weekday. 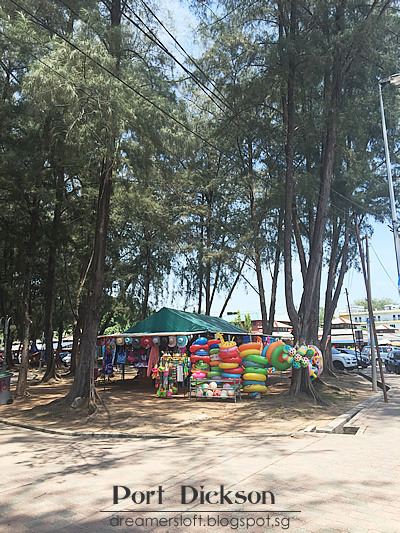 Many stalls selling swimwear, beachwear, sand toys and floats. It was freaking hot, so we decided to drop by a stall to have some coconut shake and cendol. 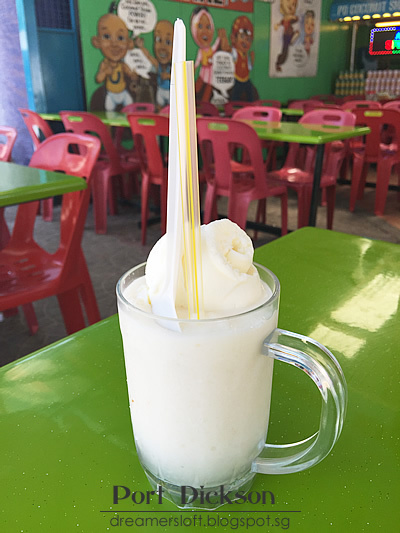 This is the PD Famous Coconut Shake Power, RM3. Power indeed, the shake was creamy, thick and very sweet. 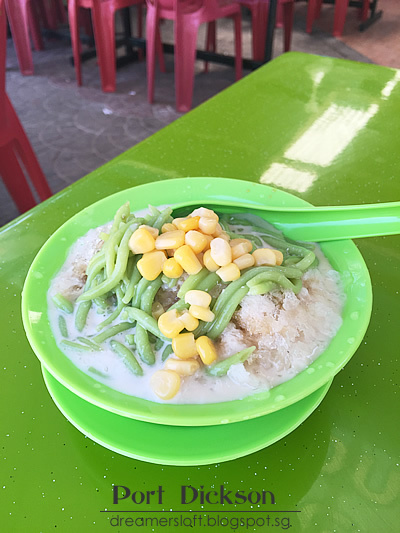 The iced cendol was very fragrant with gula melaka and coconut milk. 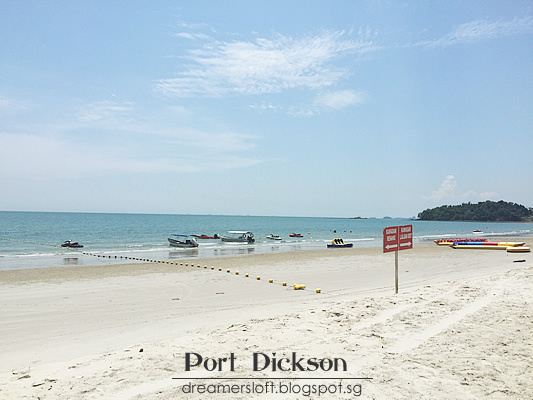 In a nutshell, we enjoyed our short getaway to Port Dickson, and with the positive experience this time, Port Dickson is once again back as one of our beach vacation choices. Did not know there are some really nice food inside of this hotel. 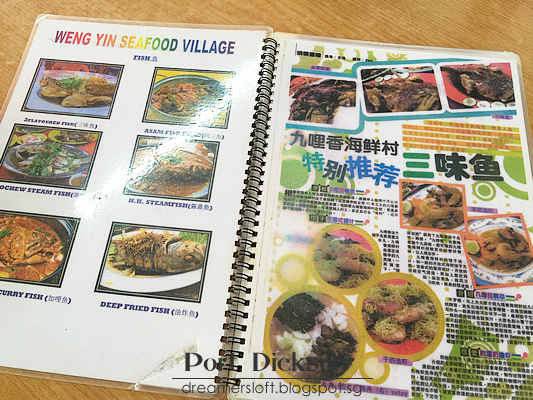 I also wrote about some of the place in PD where you can have seafood. Check out my blog!